I love the universe that Mike Mignola created to play host to the Bureau for Paranormal Research and Defence (B.P.R.D), and Hellboy. I love it so, because the stories which it unfolds are mostly based on historical truths (such as WWII, The Nazis and various other figures and events of historic significance), but with a paranormal twist. The paranormal twists it gives them though, are done in an entirely believable way. This may sound odd, but they are indeed believable stories. Why are they so appealing though? We crave to learn about the unknown. We are attracted to the mysterious. No matter how much historical knowledge one may or may not possess, in turn it is all somewhat redundant because when the unknown comes into play, almost anybody with intellect is unable to resist seeking the uncharted to add to what they know already. We are attracted to the unexplainable, perhaps because we crave the power that knowledge can bring or because of the thrill we get from decrypting and unraveling the mysterious, regardless of whether we get answers or explanations. Perhaps because we are exploring the unknown, it is therefore appealing because it enlightens our sense of adventure, as we do not know what to expect in our quest which has no visable destination. Perhaps it is because the unexplainable has no linear path, and we cannot predict the unknown, that this may arouse our sense of thrill-seaking adventure. I know a lot of people find it challenging to explain why the mysterious and the unknown appeal to the majority of us in such a profound way. That is how I would try to explain my passion (and anyone else’s passion) for stories like every single one to be published in the Hellboy universe. There is probably a lot more to it than what I said above as well. Sometimes it is hard to justify, and difficult produce a solid argument to explain it. Now, why was that chunk of ranting about ‘the unknown’ worth reading, you ask yourself? Perhaps it wasn’t. But I feel that I should really explain why it was. An announcement from Dark Horse Comics this week about a new Abe Sapien mini series, got me thinking about why I find these stories so appealing. The story is about recovering an ancient artefact from the ruins of a submarine under the ocean. It was this precise concept for a story that really got my imagination in a fluster, and I started asking myself why stories such as this one, appeal to me as much as they do. I couldn’t explain it to begin with. Perhaps you ask yourself the same questions? If not, then perhaps you’ll give it some thought, hm? 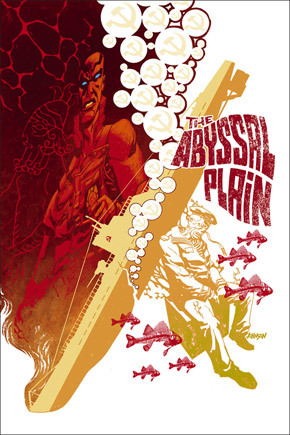 June 30th 2010 marks the start of a new mini series called ‘Abe Sapien: The Abyssal Plain’. This mini series is the second solo mini series that Abe has been given at Dark Horse Comics. 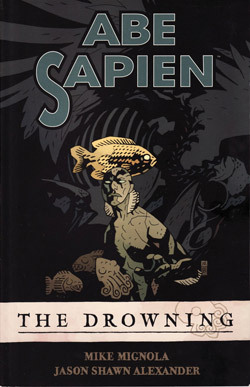 His first and most recent mini series was called ‘Abe Sapien: The Drowning’, which came out a few years back. I loved ‘The Drowning’ mini series, which had awesome art by Jason Shawn Alexander, an artist whose great work still remains vivid in my imagination to this day. That series is well worth checking out. It was set in 1981 and documented Abe’s first solo mission for the Bureau, and was a complete paranormal thrill-ride. Quite remarkable to be honest. This new mini series, is set 3 years later after ‘The Drowning’ and shows Abe in a slightly more confident role within the Bureau, as writer co-Jon Arcudi (no stranger to writing ‘B.P.R.D’) has said. In this upcoming series, the story is about Abe and a crew of Bureau agents whose task is to search a sunken Soviet U-Boat for an ancient relic. The search turns into a paranormal crime scene, and it is up to Abe to find out the truth about what happened down there, and to find a way to survive meeting a watery grave. Jon Arcudi has said that the specific artefact in question, is a burgonet (a helmet, Google Image what one looks like if you’re unaware), originally worn by an Italtian Captain fighting against the Holy Roman Empire, which is apparantly meant to have paranormal powers. The Soviets captured it from the Hitlers secret occultists, along with many other artefacts (touched on in stories of the B.P.R.D series recently). There are not many more story specifics than that at this moment. But already, this brings much excitement for me, in wanting to find out the truth about what went on down there! Arcudi states that this is going to be more of a philosophical adventure for Abe, in which we will get to see how he feels about his connection to the Bureau at that time in 1984, and how exactly he feels in his head. It all sounds really interesting. The cover images for this series look quite similar to some covers seen on issues of The Umbrella Academy or Matt Fraction’s Casanova , which funnely enough both share artwork by the same artists Fabio Moon and Gabriel Ba. They generally look quite un-B.P.R.D-ish. Still, in my opinion they are slightly cool nonetheless. 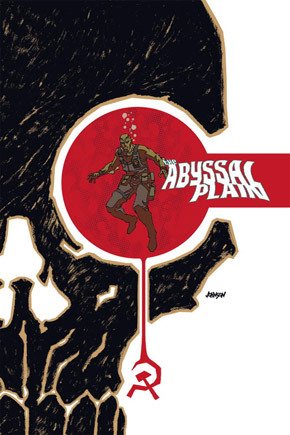 ‘Abe Sapien: The Abyssal Plain’ is to hit shelves June 30th. It is written by Mike Mignola and Jon Arcudi, with artwork by Peter Snejbjerg (B.P.R.D: War Of Frogs, Preacher and more).